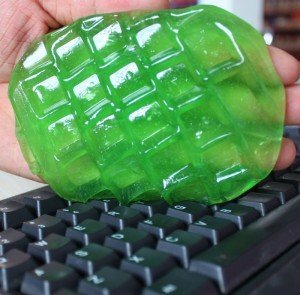 I'm wondering if there is a way to turn alcohol or another bacteria killing substance into a solid gel form, sort of like the gel you can use to clean a keyboard. I'm wondering if you could put either alcohol or other sanitizer into this sort of gel, without the sanitizer having a "best before" date. I'm a complete beginner when it comes to chemistry so forgive me if there's an obvious reason why this wouldn't work. If it does work, or partially, could you give me a run down on what I would need or need to test to achieve my goal? If your alcohol is ethanol, calcium acetate works very well. I use calcium acetate to make gel in petri dishes, and sprinkle metal salts on it for colored flame demonstrations. Calcium acetate is also used in some canned alcohols used for warming/cooking foods. 3 grams of calcium acetate dissolved in 10 ml of water will make a saturated solution (some may not dissolve, which is OK). This is mixed with 75 ml of 95% ethanol, which will then form a colloidal gel identical to that used in canned alcohol warmers. I do not know if this gel is suitable for your purposes, but it works well for a heat source. If used as a heat source, a pinch of salt should be added to the aqueous solution before mixing with alcohol to make the flame more visible. Try mixing styrofoam with gasoline and alcohol. The gasoline will kind of dissolve the styrofoam and form a paste with imbued alcohol. Use Hydroxypropylcellulose (HPC) as gelling agent. Not the answer you're looking for? Browse other questions tagged solid-state-chemistry alcohols or ask your own question. Why does hand sanitizer turn into a liquid after coming out of the bottle? How could alcohol be made into a powder? What is a good way for a laymen to purify alcohol to near 200 proof? Is there a substance that is hard (ideally abrasive) in solid form but would dissolve in water?